Amazon ranks the sales of all of its products -- books as well as computers and Tootsie Rolls. The competitive ranking can be terrible for an author's ego -- or good. Amazon’s sales ranking is cryptic, confusing, convoluted, confounding, complicated and not particularly useful. Amazon says, “The calculation is based on sales and is updated each hour to reflect recent and historical sales of every item sold.” The lower the number, the better the book was selling at a particular moment. It can feel really good to crack the top one hundred. I am using today's blog post to exercise my bragging rights (temporary as they may be). 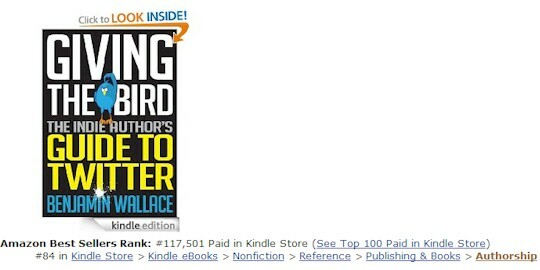 [below] A book about writing dirty books was ranked #22 in the authorship category. [below] A book about writing 'Christian novels' was ranked #51 in the authorship category. [below] My brand-new book about tax deductions and other business issues for writers was ranked #72 in the authorship category. It had been on sale for just two days. I had not done any significant promotion, so this ranking made me feel really good. As we enter the season for doing tax returns, this $2.99 book might save you hundreds or thousands of dollars. [below] A book about author tweeting' was ranked #84 in the authorship category. I beat the Tweet. Nyah-nyah-nyah-nyah-nyah.